Happy Easter to all Anne Boleyn Files followers! I hope you have a wonderful Sunday whatever your plans are. You can read about how Easter was celebrated in my article from last year – He is Risen – Easter Sunday and the Tudors. 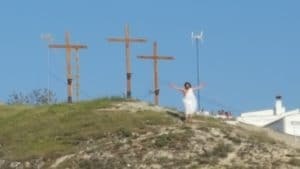 COMMENTS ABOUT "He is risen! Happy Easter!" 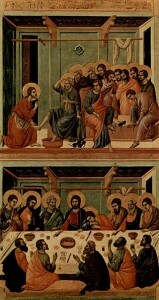 Today, the day before Good Friday, is Maundy Thursday or Holy Thursday. It’s the day that commemorates the Last Supper, that final and special meal that Jesus Christ had with his disciples, and where he washed their feet. As I’ve explained in previous articles, the Gospels’ account of Jesus washing his disciples’ feet was remembered and re-enacted by thepPope, from at least the eleventh century. The pope would wash the feet of twelve of his subdeacons on Maundy Thursday. The present pope, Pope Francis, also re-enacts this event. In 2016, he washed the feet of asylum seekers; in 2017, he washed the feet of refugees; in 2018, he washed the feet of inmates at Rome’s Regina Coeli Prison, and this year he is due to wash inmates’ feet at the prison at Velletri. In England, from the reign of King Edward II, monarchs also re-enacted this foot washing, choosing to wash the feet of poor people. On Maundy Thursday each year, the monarch and his consort would wash the feet of as many poor people as years they were old and purses of Maundy money (alms) would also be given to these people. The monarch no longer washes people’s feet, but our present queen, Queen Elizabeth II, still attends the special Maundy Thursday service and hands out Maundy Money to pensioners from the community. Today, she was joined by Princess Eugenie at the service at St George’s Chapel, Windsor, where commemorative purses were given to 93 men and 93 women. See Maundy Thursday: Queen joined by Eugenie at Windsor service for a news report and photos. You can read more about Queen Anne Boleyn and Maundy Thursday by clicking here. The 18th April was also the day when Eustace Chapuys, the imperial ambassador, ended up paying reverence to Queen Anne Boleyn. Click here for more. COMMENTS ABOUT "The royals and Maundy Thursday"